Think New Hampshire isn’t getting enough political attention? You’re probably alone, but a long-awaited move by Gov. Maggie Hassan (D) will likely result, remarkably, in an even greater focus on the Granite State during the 2016 cycle. Hassan announced Monday that she will challenge incumbent Sen. Kelly Ayotte (R) in the state’s U.S. Senate contest next November, a decision with major consequences not only for that contest but also the state’s concurrent gubernatorial election. The result, at least for the time being, is two toss-up races. The Ayotte-Hassan Senate contest immediately becomes a Toss-up, having previously been a Leans Republican race while Hassan mulled her options. Correspondingly, the now-open gubernatorial election is also a Toss-up, moving from Leans Democratic. Hassan was far and away Democrats’ strongest possible candidate to take on Ayotte; thus, the governor’s Senate candidacy increases her party’s chances of recovering a majority in Congress’ upper chamber. After all, conservative groups had spent the last few months running ads trying to discourage Hassan from running for Senate, a sign that the GOP also viewed her as the Democratic best bet. Early polling, for what it’s worth over a year out, shows a tight race. 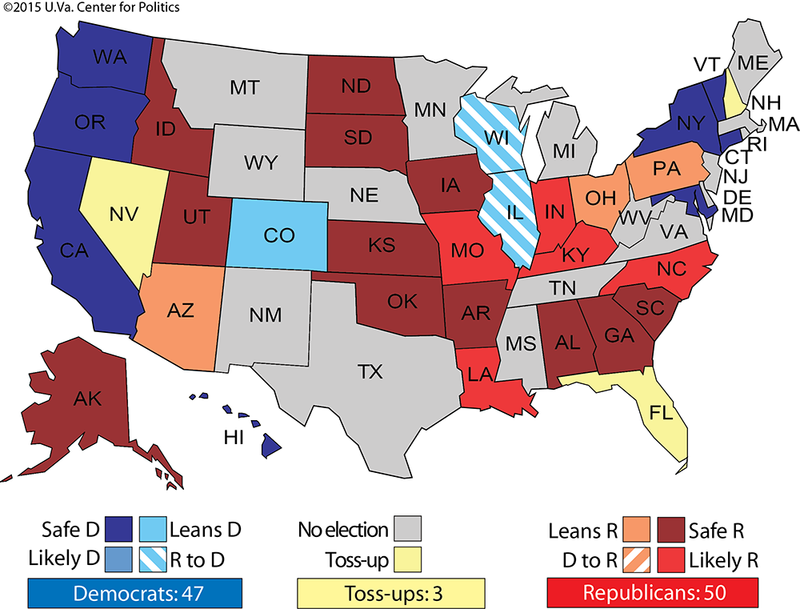 The overall Senate math looks like this: If the Democrats can win the Crystal Ball’s three toss-up contests (New Hampshire joins open-seat races in Florida and Nevada in that group), our current ratings (Map 1) would work out to a 50-50 Senate tie, with the presidential race deciding Senate control via the vice presidency. While that still means threading the needle to a significant extent for Democrats, they could conceivably have a shot at getting to a tie without defeating some other incumbent Republicans in competitive states, such as Sens. Rob Portman (R-OH) and Pat Toomey (R-PA). And one or both of Portman or Toomey could conceivably lose, especially if their states go Democratic at the presidential level. Hassan’s run provides Democrats with an additional path to Senate control. However, the ratings shift in the New Hampshire Senate contest doesn’t mean the incumbent is weak — far from it. Ayotte’s latest fundraising numbers — $5 million cash on hand — suggest she’ll be anything but a pushover, and Hassan will have plenty of catching up to do in that department. The new rating is partly a reflection of the fact that Hassan is a huge recruitment bonanza for national Democrats, but it is also indicative of the relatively balanced political landscape in the Granite State. President Obama won it in 2012, but only six states were decided by a smaller margin; a 20,000-vote swing (2.8%) toward Romney would have won the state for the GOP. New Hampshire has been a swing state in presidential elections since the 1992 election — in that time, it has never deviated more than ±2.65% away from the national two-party vote. 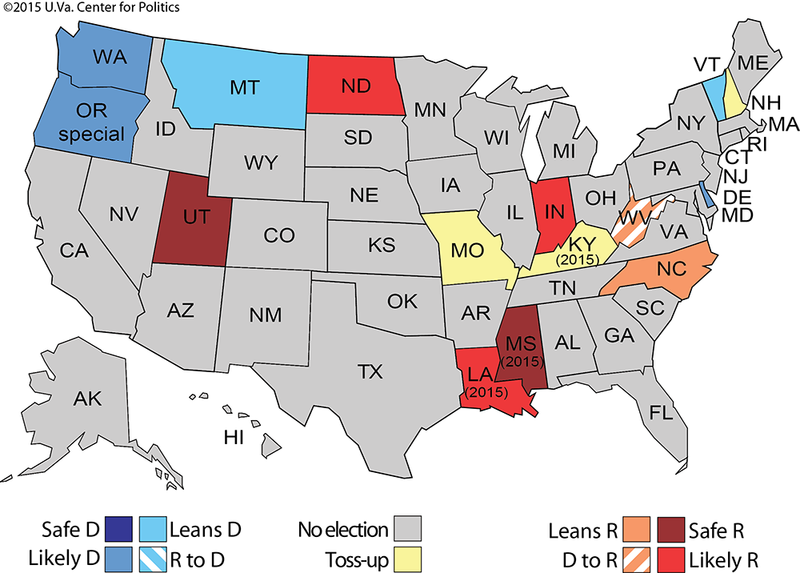 There’s really every indication that the state’s high level of presidential competitiveness will continue in 2016, to be joined not only by the Senate race, but also the gubernatorial contest. Many question marks remain in the 2016 race to replace Hassan in Concord, but now that she’s announced her plans, gubernatorial candidacies on both sides will begin to materialize. So far, the only declared candidate is Executive Councilor Chris Sununu (R), a member of Granite State Republican royalty. His father, John H. Sununu, was a three-term governor and later President George H.W. Bush’s White House chief of staff for nearly three years, while his brother, John E. Sununu, won election to the U.S. Senate in 2002 but lost reelection to current Sen. Jeanne Shaheen (D) in 2008. The youngest Sununu may have the edge in the GOP gubernatorial field, but others are considering the race, including ex-congressman and state Senate Majority Leader Jeb Bradley (R), state Rep. Frank Edelblut (R), and state Sen. Jeanie Forrester (R). There are numerous names being bandied about on the Democratic side, including at least one of Sununu’s colleagues on the state’s five-member Executive Council, Colin Van Ostern (D), who intends to announce his plans shortly. Other possibilities might be former state securities chief Mark Connolly, state Sen. Andrew Hosmer (D), and Portsmouth City Councilor Stefany Shaheen (Sen. Shaheen’s daughter), among many others. The 2016 election may still be over a year away, but as it stands New Hampshire is “toss-up central”: It holds this designation on our Electoral College map, as well as in its Senate and gubernatorial races. Additionally, the U.S. House election in NH-1 is also a toss-up. In that race, Rep. Frank Guinta (R) appears quite vulnerable in the wake of a fundraising scandal; if he wins renomination — which remains to be seen — he may face ex-Rep. Carol Shea-Porter (D) in the general election for the fourth-straight time (Guinta defeated Shea-Porter in 2010, Shea-Porter won the rematch in 2012, and Guinta returned the favor in 2014). All in all, it’s even safer than usual to assert that New Hampshire is at the epicenter of American politics in 2016.